Who doesn’t love barbecuing in the summer? And, who doesn’t love delicious smoked meats? Now, you can have both, whenever you want, when you are cooking on the Traeger TFB42LZBC Lil Tex Elite grill and smoker. This may not be the largest grill and smoker on the market, but it is huge on features that will ensure that you always create amazing tasting meals. You can use it to grill, smoke, bake, barbecue, broil, and braise, so you can make an entire meal, including dessert, all in your back yard. The Traeger TFB42LZBC Lil Tex Elite allows you to grill and smoke meats without ever having to use charcoal or propane. It uses natural, hardwood pellets that will give you that delicious, smoky flavor without having to taste any gas or have the mess involved with using charcoal. This is a six-in-one cooker that lets you do it all, and everything will come out to perfection because of the integrated Digital Elite Controller that keeps the temperatures steady within ±20°F. This is the ideal grill and smoker for the home cook, with 418 square inches of grilling space that allows you to cook up to 16 burgers, four whole chickens, or five racks of ribs. It is easy to use, as all you have to do is set it and pretty much forget it until your meat is smoked to perfection. It doesn’t get much easier than that. If you are a backyard chef who loves to cook for large groups, this may not be the grill and smoker for you. But, if you are into small- to medium-sized get-togethers, this is an option you need to seriously consider. 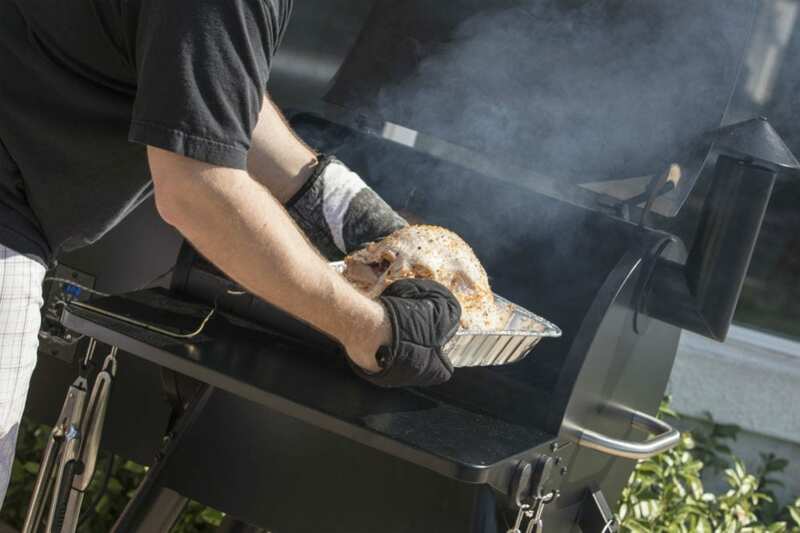 The Traeger TFB42LZBC Lil Tex Elite grill and smoker has 418 square inches of grilling space, enough to be able to cook 16 burgers, four whole chickens, or five racks of ribs. Whether you have years of experience smoking meats, or you are just starting out, this is a grill and smoker that you are going to love using. It is easy to use and offers consistency with the temperature, so you never have to worry about meat being undercooked or overcooked. When you open the box, you will find the Traeger TFB42LZBC Lil Tex Elite, and all of the smaller parts are tucked neatly inside the grilling section. You will receive everything you need to put it all together, except the tools, which you will need to provide yourself. This kit includes the chimney, legs, and handy wheels that let you move the grill around as needed. The instructions and owner’s manual are also inside, along with the drip pan. It is just as easy to set the temperature on this grill and smoker as it is to set your oven. The Digital Elite Controller ensures that the cooking temperatures stay as precise as possible, with few fluctuations. You don’t have to worry about using any fire starters, charcoal chimneys, etc. to ignite this grill and smoker. All you have to do is flip the on/off switch, and it is ready to start cooking on. The porcelain grill grates have a non-stick surface that ensures your meat isn’t going to stick. They are also easy to clean, so you can spend more time enjoying quality grilled foods with family and friends and less time doing dishes. 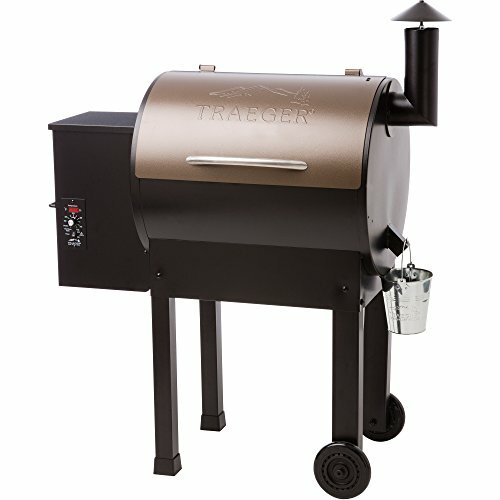 The Traeger TFB42LZBC Lil Tex Elite is made from powerful steel and has a durable powder-coated finish. This grill is truly built to last, and you are going to be getting many years of use out of it. The one problem we have found with the Traeger TFB42LZBC Lil Tex Elite is that the control unit has a tendency to stop working. But, Traeger does offer a limited warranty protecting you against manufacturer defects. If you have any issues, you can contact customer service for a refund or replacement. The Traeger TFB42LZBC Lil Tex Elite grill and smoker is easy to assemble (check out this video on assembly https://www.youtube.com/watch?v=7LIqZLiR5qI), and even easier to use. Place the pellets in the hopper, and the auger will pull them into the fire pot, and then a hot rod ignites the pellets. There is an induction fan that stokes the fire, and the heat and smoke circulate around the barrel. There is a grease drip tray that keeps the grease out of your food. The controller ensures that the temperature is always accurate with no major fluctuations. Another grill and smoker that falls in the same budget range we think you might be interested in is the Pit Boss 71820FB pellet grill with flame broiler. This grill has 820 square inches of grilling space, so you can cook plenty of burgers, chicken, steaks, etc. for a crowd. Enjoy flame-broiled burgers thanks to the flame broiler that allows for open-flame searing, and a great cooking temperature range from 180°-500° F.
If you are looking for a grill and smoker that is just the right size for small to medium-sized get-togethers, the Traeger TFB42LZBC Lil Tex Elite is one that you need to check out. It is easy to assemble, easy to use, and you will be able to grill or smoke meats to perfection, even if you have never done either before. At its price point, it is a great value, and its durability will ensure that it lasts for many years to come.